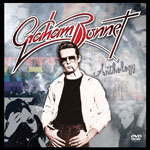 Share the post "Album review: GRAHAM BONNET – Anthology"
Graham Bonnet is enjoying something of a revival at the moment with his new band, but not least as a result of a spate of recent reissues. “Anthology” is, therefore, a very good starting point for further investigation of his back catalogue. It brings together a near-definitive collection of his work since the late-1960s when he had a Top 5 hit single with his cousin as “The Marbles”. That song ‘Only One Woman’ is included here with another – ‘Warm Ride’ – which was similarly penned by the Bee Gees. This early association with Maurice, Barry and Robin gave Graham his first big break. Bonnet’s career would head in a completely different direction ten years later, but in the meantime he released several solo albums including the mothballed debut on DJM in 1974 (since reissued) where he did a “Paul McCartney’ reflecting the eclecticism of Macca’s solo debut. The following eponymous album in 1977 and ‘No Bad Habits’ (both represented in this collection and reviewed elsewhere – see below) continued the varied approach. But it wasn’t until Ritchie Blackmore rediscovered Bonnet’s late-1960s work and sought him out to replace Ronnie James Dio in Rainbow that the Skegness-born singer was catapulted to a whole new audience, and career direction. From then on, Bonnet fronted several significant guitarists even if sometimes for brief tenures. So, with Rainbow he only recorded one album and likewise, with the Michael Schenker Group. He was sacked from the latter in 1982 after exposing himself at a riotous gig in Sheffield. That incident is the stuff of rock legend and the publicity actually helped his next band Alcatrazz gain a foothold in the States. Originally with the nascent guitar legend Yngwie Malmsteen, then with Steve Vai, the band made three studio albums and are well represented here with seven tracks. After that time, Bonnet involved himself with various projects including Impellitteri, Forcefield (with Ray Fenwick and Jan Akkerman) and the equally short-lived Blackthorne which reunited him with Alcatrazz keyboard player Jimmy Waldo (also a member of his current band). To complete the story, the collection includes tracks from his time with Japanese band Anthem, Taz Taylor, and brings the page up to date with three tracks from his current band from 2015. ‘My Kingdom Come’ reunited him with songwriter Russ Ballard who had also contributed to his 1981 solo album ‘Line Up’. “Anthology ” makes a bold statement of an idiosyncratic singer whose visual appearance – at least in the 1980s – belied his rock star credentials. Bonnet’s clean cut, well-groomed appearance was inspired by the 1950s crooners whose music he loved. Whilst he may not have looked like your average heavy rocker he made his mark with powerful vocals and a great musicality. Bonnet adds his own thoughts to the booklet and a DVD completes the package with selected videos including a rare 1988 performance with Impellitteri. The liner note is only light on the later solo albums (‘Underground’ and ‘The Day I Went Mad’). The curious fan will probably want to track down the excellent Alcatrazz box set released in 2016 (Store For Music). And more of the back story is revealed in Steve Wright’s 2016 official biography ‘The Story Behind The Shades’. This entry was posted in ALBUM REVIEWS, ALBUM REVIEWS (Mobile), All Posts, INTERVIEWS, Radio interview, The Best of 2017 and tagged album, Alcatrazz, Anthem, anthology, Blackthorne, box set, Forcefield, Graham Bonnet, hard rock, heavy rock, Impellitteri, interview, Marbles, Michael Schenker Group, Rainbow, review, Taz Taylor. Bookmark the permalink.